What is your definition of mass incarceration? It is likely much broader than you think, affecting more segments of our communities. We traditionally think of incarceration as being people who are behind bars because they have been convicted of a crime. However, mass incarceration is not just about America's long overdue need for criminal justice reform. It's also happening on a massive scale to people with disabilities who haven't done anything wrong. As page one of The New York Times recently pointed out, there are thousands of people with disabilities being held against their will in nursing homes and other institutions in South Dakota. And tragically, this is not just happening in South Dakota, where the Department of Justice is rightfully asking serious questions. It's happening all over. Read this story by NPR's Joe Shapiro on Rosa Hendrix, an 88-year-old woman who said, in her own words, she got "stuck" in a nursing home for six years. "A home means to me where you are not in prison. Where you don't have to have somebody to tell you what you can do, when you can do it and how you can do it," she says. People with disabilities who are trapped in nursing homes did not do anything wrong. So why are they essentially imprisoned? This type of institutional bias is in part because of Ableism, when able-bodied people think that people who have disabilities are somehow less human, less valuable, and less capable than others. That is why some people think it's alright to take away the rights of an individual with a disability to live in the community of their choice. Stripping people of their rights needs to stop now. But how? Interestingly, South Dakota Governor Dennis Daugaard, who was raised by Deaf parents, is a real champion for people with disabilities. Our group has frequently praised his outstanding work on employment for people with disabilities. Indeed, South Dakota has the highest employment rate for people with disabilities in America and their Ability for Hire campaign shines a spotlight on the talents of employees with disabilities. We know that the Governor can bring his imagination and implementation skills to make this situation better as well. The U.S. Department of Justice actions will focus much needed attention to the issue of forced institutionalization, and I have no doubt that South Dakota leaders are up to the challenge. Enabling people to stay in their own homes and communities as long as possible is the right thing to do, and it also can also be much LESS EXPENSIVE than putting people in 24 hour a day staffed nursing facilities. 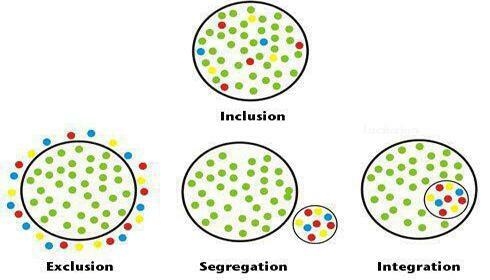 Inclusion means keeping people with disabilities in their natural environment -- with their family and friends. There are organizations out there doing important work. For instance, ADAPT is working with Senator Schumer and others on passing the Disability Integration Act (DIA), which has been endorsed both by both former Secretary of State Hillary Clinton and Senator Bernie Sanders. The DIA still needs Republican support to move forward. Groups such as the Bazelon Center and AARP are also doing very important work on these issues. It is extremely important to do all we can to enable people with disabilities to be as integrated into the community as they want to be. The key is making real choices possible.